(17/P109) TRENTON – The New Jersey Division of Parks and Forestry today officially launched a new smart device tool to enhance visits to state parks by helping users plan visits around the state park system’s vast network of trails. The Trail Tracker application, demonstrated by the Park Service during a news conference today at Allaire State Park in Monmouth County, may be downloaded to smart devices to help visitors make detailed plans tailored to trails, activities and terrain that interest them. 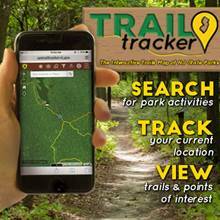 The Trail Tracker tool helps visitors find activities available at state parks and forests during each season, search for trails by difficulty ratings and points of interest, and access detailed geographic maps that provide information on terrain and natural features along trails. The tool also enhances safety by enabling visitors to maintain their bearings while hiking and by providing emergency contact numbers. Trail Tracker was soft-launched earlier this year and has been available to users for approximately two months. It was developed by the Division of Parks and Forestry’s Geographic Information System (GIS) department as part of a project to map and highlight amenities in the state park system. 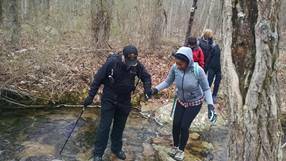 The state park system boasts nearly 1,000 miles of officially designated trails.